Colourful and beautifully decorated textiles were hanging above our heads. Men and women were sitting on the stairs of a church selling flowers. Someone was walking a pig on a leash. Yes, a pig on a leash. Some women were washing their clothes in the outdoor laundry. Some others were carrying a child in a baby carrier and a basket on their head. Every woman we met on our way was wearing a typical Mayan dress. These very few words describe perfectly how the Chichicastenango market looks like. The famous market takes place on Thursdays and Sundays. It is an absolute must-see during your stay at the Atitlan Lake. It is situated about 40 km from Panajachel, but due to the curvy roads, it takes over an hour to get there. The last part of the drive is a canyon. First, you have to drive all the way down on a very curvy road and then go up. You will see many chicken buses on your way heading to or from the market. The White Church at the market is the Church of Santo Tomás. It has 18 stairs – each for one month of the Mayan Calendar Year. Priests use it for their rituals, burn incenses and candles. In some occasions, they burn a chicken for the gods. Inside the market, there are eateries (comedores) with typical Guatemalan food. You can even go up in the building and watch them from upstairs. Green: red and blue are general colours. Sometimes the tomb painted in the favourite colour of the person that died. On the way to the cemetery, we went for a coffee to a hotel. There was a little garden with huge trees and parrots. Since we were there with our Little daughter, she had great fun. She didn’t enjoy much walking around the stands. However, he enjoyed looking at the majestic colourful birds. 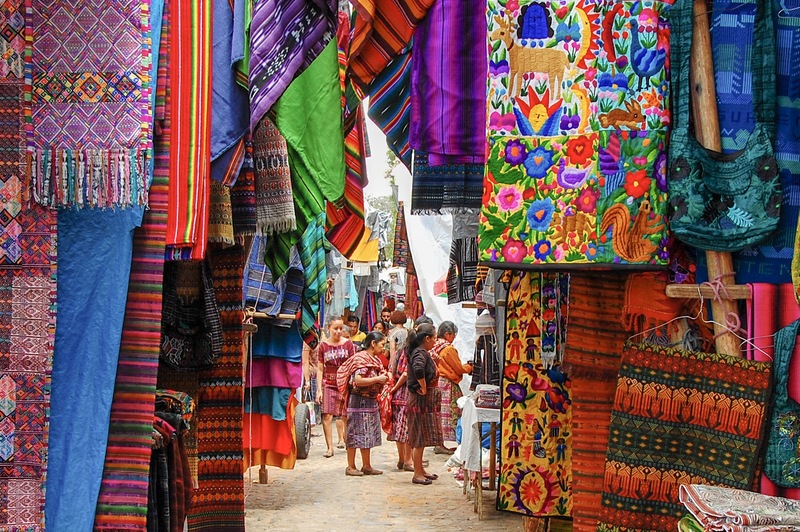 Chichicastenango market is a pleasant place to visit. It is a must-see place during your stay at the Atitlan Lake. You will need a couple of hours to see it. I recommend to go there early in the morning and leave your car at one of the parking. Also be aware of pickpockets.